Hey! 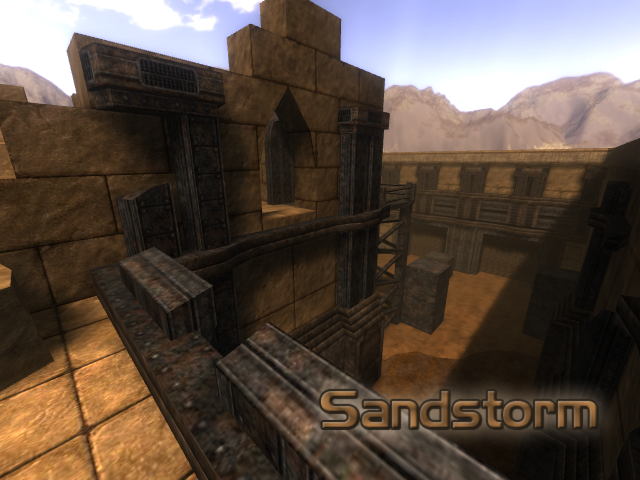 This is our newest map, made for FFA and Instagib Deathmatches. One side of the map was supposed to be the first part of a singleplayer map i started months ago, so it's quite narrow compared to other maps. But we figured out, that it gives the map a very special gameplay! Thanks to Misan, who had the idea of turning it into a Deathmatch map and helped me enlarge the part that was already there, and to Suicizer, who helped us finding some mistakes in the map. Hehe, this map looks great ;) I just love the broken parts, they just look awesome. It is very narrow though, the lower part almost is unplayable, at least for me. I get stuck by "obstacles" at almost every wall...some more clip and noclip material surely would help a ton. Good lighting...you just used 8 lights in all, and the map looks good lit already. I especially like the fact that you used at least some different light colours. If this map was perfectly playable without getting stuck or stopped by obstacles, i'd surely rate it 5/5.